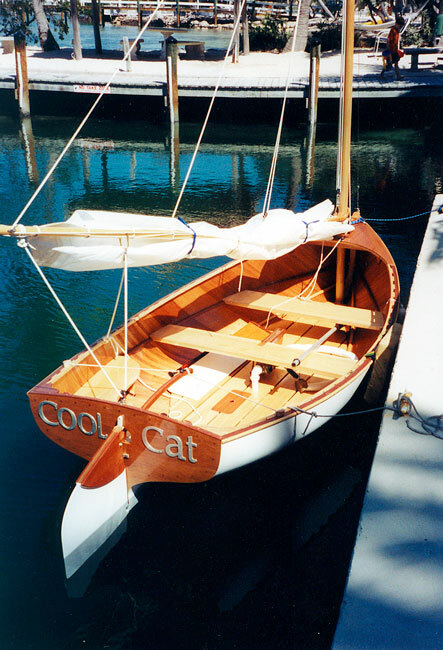 Jay Eugster writes "Here is a catboat I built in 2004 called COOL CAT, the plans of which were in your Fifty Wooden Boats to Build, it is a 11' dinghy by Charles Wittholz. It is 11' long, 5' beam with the gaff rig and dagger board. I launched it in Florida in the middle of February 2004 having trailered it down especially for the occasion. I cold molded it out of mahogany with pine seats and floorboards. I expect to use it throughout the lakes and bays of New England." Contact Jay at 161 Birdseye Road, Shelton, CT 06484.